Among performance-boat enthusiasts, arguing about brand superiority is more than an entertaining pastime. It’s a lifestyle. Whether you currently own a go-fast boat or not, you probably have a favorite brand that you believe is superior to all others. And no one can convince you otherwise. That’s a good thing, right? Without that kind of passion, the high-performance marine industry withers and dies. 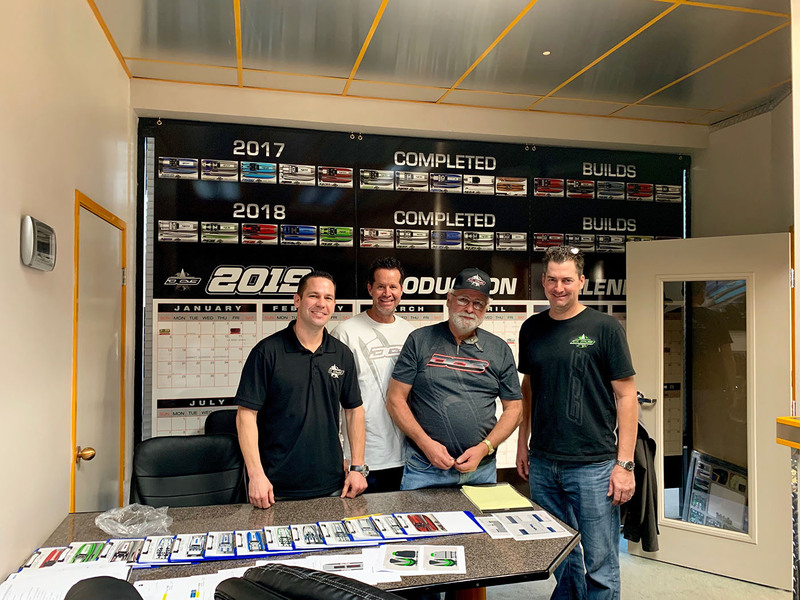 (From left) Jeff Johnston, Tony Chiaramonte, Peter Hledin and Paul Miller formed a mutual admiration society at DCB Performance Boats last week. Yet, while there is plenty of pettiness and no shortage of squabbles within the industry, there also is respect among builders at the highest level. Case in point, Peter Hledin, the founder and owner of Skater Powerboats in Douglas, Mich., and Jeff Johnston, Tony Chiaramonte, Paul Miller and the rest of the crew at DCB Performance Boats in El Cajon, Calif. Last week, Hledin paid a visit to DCB—his first—and spent a day hanging out with the DCB team. Hledin was quick to dismiss the endless and often tedious debate about DCB center-pod catamarans versus Skater’s complete-tunnel catamarans, an immensely popular argument among performance-boat fans. “With the kind of power available today, you can take almost any hull configuration and make it go more than fast enough,” he said. “If one hull design is not necessarily as ‘fast’ as another, who cares as long as it’s safe? For the people at DCB, the love-fest was mutual. “Skater builds the ultimate high-performance catamaran and Pete is a cornerstone of the performance-boat industry,” said Johnston, the president of DCB. “It was so cool having him here. I’ve known Pete since my days selling ads at Powerboat magazine and propellers for Hering. East met West last week in Southern California and—to borrow from an old Thompson Twins song—both stepped into the gap. But truth be told, there was no gap. Mutual respect and admiration existed between the people behind DCB and Skater long they got together, regardless of the endless debate between fans of both brands.